The Beatles' first exposure to heroin is believed to have taken place in 1965. While filming Help! on Huntington Hartford's estate on Paradise Island in the Bahamas, director Richard Lester witnessed two women attempting to introduce Paul McCartney to the drug. [Lester] accidentally overheard two of the most beautiful women he had ever seen, dressed in identical, stunning black swimsuits, try to coax Paul into taking heroin. The combination of their sexual come-on and the enticement towards hard drugs was one of the most chillingly evil moments Lester has ever encountered … His sense of relief when Paul rebuffed the twosome was profound. In a 2004 interview with Uncut magazine, Paul McCartney described how he did take heroin, albeit unwittingly, in the 1960s. I tried heroin just the once. Even then, I didn't realize I'd taken it. I was just handed something, smoked it, then found out what it was. It didn't do anything for me, which was lucky because I wouldn't have fancied heading down that road. The account contradicts a passage in McCartney's authorised biography, in which he recalls snorting the drug with art dealer Robert Fraser. I was very frightened of drugs, having a nurse mother, so I was always cautious, thank God as it turned out, because I would be in rooms with guys who would say, 'Do you want to sniff a little heroin?' and I would say, 'Well, just a little.' I did some with Robert Fraser, and some of the boys in the Stones who were doing things like that. I always refer to it as walking through a minefield, and I was lucky because had anyone hit me with a real dose that I loved, I would have been a heroin addict. A lot of his friends messed around with heroin. A lot of his lords and ladies were heroin addicts and had been for many many years. And give Robert his due, he knew I wasn't that keen. He knew I wasn't a nutter for that kind of stuff. So I did sniff heroin with him once, but I said afterwards, 'I'm not sure about this, man. It didn't really do anything for me,' and he said, 'In that case, I won't offer you again.' And I didn't take it again. I was often around it when they'd all be doing it. They'd repair to the toilet and I'd say, 'I'm all right, thanks, no.' One of the most difficult things about that period was the peer pressure to do that. From around the middle of 1968 through to the latter months of 1969, John Lennon was addicted to heroin. While never made as explicitly public as The Beatles' use of LSD, it found its way into his songs, chiefly Happiness Is A Warm Gun ("I need a fix 'cause I'm going down") and Everybody's Got Something To Hide Except Me And My Monkey ("The deeper you go the higher you fly"), both on The Beatles (White Album). He was getting into harder drugs than we'd been into and so his songs were taking on more references to heroin. Until that point we had made rather mild, oblique references to pot or LSD. But now John started talking about fixes and monkeys and it was harder terminology which the rest of us weren't into. We were disappointed that he was getting into heroin because we didn't really know how we could help him. We just hoped it wouldn't go too far. In actual fact, he did end up clean but this was the period when he was on it. It was a tough period for John, but often that adversity and craziness can lead to good art, as I think it did in this case. Lennon's heroin addiction peaked during the protracted sessions for Let It Be, which saw him largely withdraw creatively from the band. In 1970 he put his usage down to the treatment Yoko Ono received from the others in The Beatles' circle. Lennon later admitted he was addicted to heroin at the time of the Plastic Ono Band's performance at the Toronto Rock and Roll Revival festival on 13 September 1969. It has been suggested that heroin withdrawal was one of the reasons behind Yoko Ono's miscarriage, which she suffered on 12 October 1969. In her June 2007 appearance on the BBC Radio 4 programme Desert Island Discs, Ono suggested that the low purity of their heroin or lack of regular supply made it easier for them to kick the habit. Luckily we never injected because both of us were totally scared about needles. So that probably saved us. And the other thing that saved us was our connection was not very good. Cold Turkey, released in October 1969, detailed the couple's experiences of withdrawal. It had previously been rejected by Paul McCartney as a potential Beatles single, and so was released by the Plastic Ono Band. Recorded and released before The Beatles had officially split, it featured Eric Clapton on guitar, Klaus Voormann on bass and Ringo Starr on drums. If you enjoyed this feature, don't miss the full story! 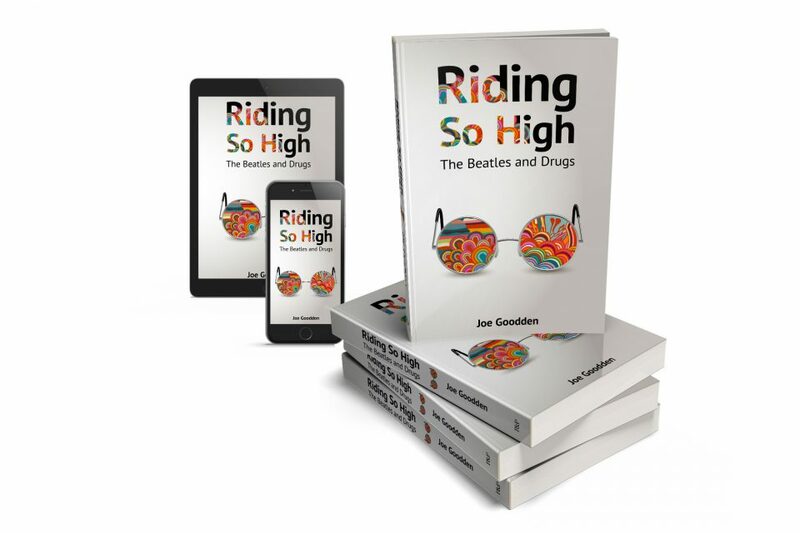 Riding So High – The Beatles and Drugs charts the Beatles’ extraordinary odyssey from teenage drinking and pill-popping, to cannabis, LSD, the psychedelic Summer of Love and the darkness beyond.